Assorted Pieces of Split Wood Logs that are approx. 2 to 3 inches in diameter with at least one of the split sides being flat. Print-outs of words or stickers for personalization. Using your saw, cut a 2 to 3 inch piece off of your split wood log. With sandpaper, smooth the ends cut by the saw. Set the wood on its flat split side (that will become the bottom of the holder with the rounded bark end up at the top of the holder). 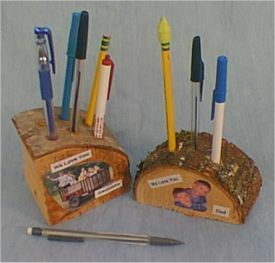 Decide how many pen and pencil holes you want in your holder. Drill that number of holes into the top of the holder (through the bark) at least 1/2 inch apart. Cut out the pieces of your photos and the words that you want to use to decorate and personalize your holder and decide where you want to place each piece. Using your paintbrush, brush one coat of decoupage clear coat medium over the front (one of the smoothed ends) of your holder. Then carefully attach the photo pieces onto the holder by brushing a little decoupage clear coat medium on the back and then sticking them in place. Stick any words into place by just sticking them onto the wet clear coat. Completely cover the design* and the whole front side with decoupage clear coat. You may choose to cover the front with one more coat for a better finish. A Great Gift for Dad or the Outdoor Fan who is stuck at a desk for work!